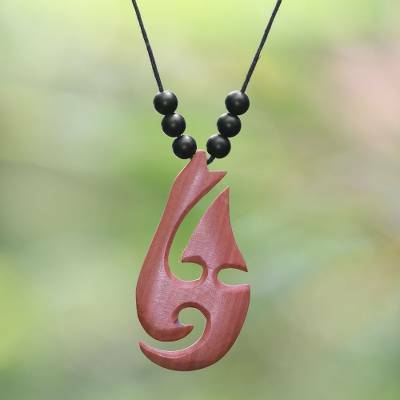 Adjustable Onyx and Sawo Wood Pendant Necklace from Bali, "Bright Lidah Api"
Hand-carved of sawo wood, marvelous stylized flame designs are realized in the pendant of this necklace from Bali, flanked by dark onyx beads. Representing artisans with physical disabilities, Bhakti Senang Hati presents the adjustable necklace, adorning the wearer on an adjustable length of cotton cord. Gusti Lanang creates the necklace, naming it Lidah Api, meaning "the tip of the flame" in Indonesian. "I was born in Tabanan Bali, the fifth of six siblings. I studied only until the second year of junior high school because my parents couldn't pay the school fee. When I was 14, my father passed away. That same year, I had a bad motorbike accident and had to have one of my legs amputated. I joined the foundation in 2007 and here I met the woman who became my wife. Now we have a son. My wife and I work together to provide for our little family and prepare for the future. I craft our products by hand, and my wife helps me. I hope you like our designs." Bhakti Senang Hati was founded and is run by people with physical challenges who provide a special service for the physically challenged in Bali. The society also provides wheelchairs and housing, and runs Bhakti Senang Hati Places, a home for children with disabilities. The seven artisans who are members of the foundation use a wheelchair or have a prosthetic leg. This does not stop them from living a full-life and striving to be self-sufficient. The Bakti Senang Hati Foundation assists persons with disabilities. Living with a disability can be more difficult in Bali than in other places. Bali's Hindu culture carries with it the additional stigma of karma. To be disabled is the physical manifestation of bad karma. Traditionally, the disabled were hidden away and isolation was added to their burden. Attitudes are slowly changing and programs such as the Bakti Senang Hati Foundation teach self-confidence as well as the practical skills that will enable their members to become self-supporting. Although their Novica sales do not provide enough income for each artisan to be self-supporting, these sales have a profound impact on their lives. The income contributes not only to their financial stability but also to their self-esteem. It is important to these artisans that their work is seen and appreciated around the world. There are eight children that the Bakti Senang Hati artisans are able to provide for. The Bakti Senang Foundation provides for the education of eight children. "Bright Lidah Api carved wood pendant"